How do you choose which cars to video and the locations? Usually the cars which we choose for reviews are the latest models to the Volkswagen, SKODA and SEAT ranges. 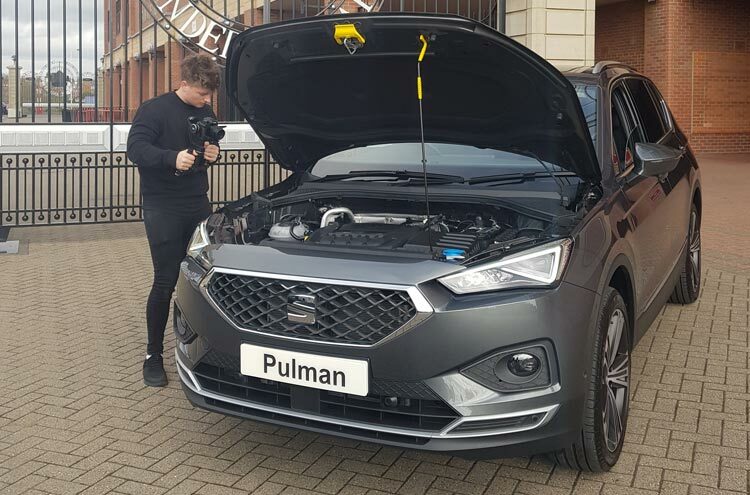 We work alongside Graham Courtney, avid car enthusiast Motor Journalist and North East correspondent for talkSPORT radio, and The Social Co. to create the reviews. We then put all of our heads together to decide on suitable locations for each car. Usually the location is in Durham & Sunderland to keep in line with the Pulman brand origin. How long does a typical review video take? 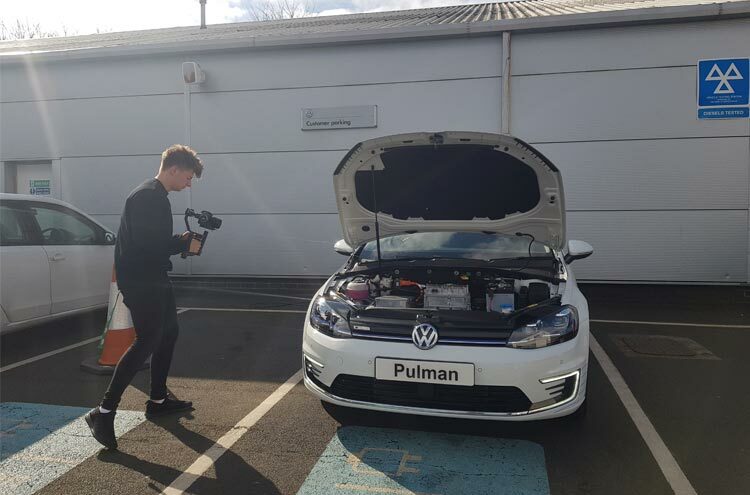 Prior to the day of filming, Graham and Pulman together will create a script for the selected car before final proof, this is then sent over to The Social Co. so they can plan the shots and areas to use at the selected locations. At our end, we communicate with the branch where we are sourcing the car from to ensure it is ready for its film debut. On the day it can take between 2 to 3 hours to get all of the shots required, this includes driving to the locations too! Usually the exterior shots will all be taken first, this is a mixture between video and image shots. Also, Graham will record the on the road review from the driver’s seat which is an overview of the car whilst driving along the location. Afterwards Graham will send across the voiceover for all of the script to both Pulman and The Social Co. and the editing begins which usually takes around a week. What happens when you are behind the scenes at the car reviews? Behind the scenes we will coordinate with The Social Co. and Graham on which shots to take and which areas of the location to use. We also like to take our own images and short videos to share on our social channels to keep our followers up-to-date! We will also ensure there are no obstructions in the shots such as cones, rubbish or people (unless we have their consent to do so!). What are the latest car reviews you’ve been involved in? 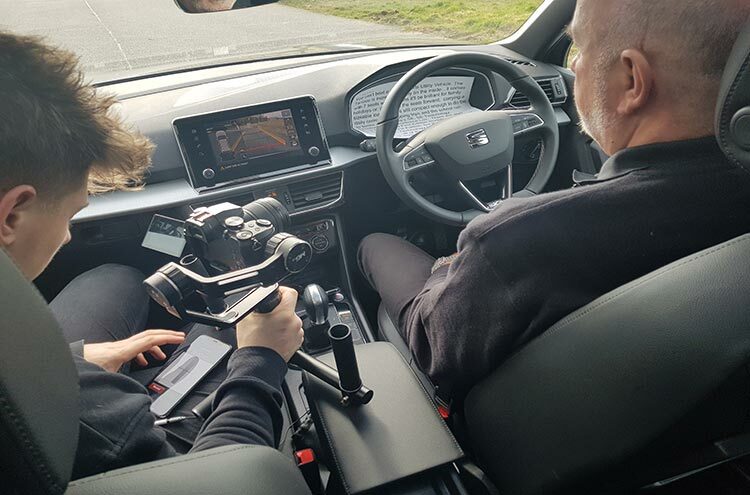 On Wednesday 20th March we recorded reviews for the new 7-seater SEAT Tarraco and the new all electric Volkswagen e-Golf around the Sunderland area. Thankfully the weather stayed dry and it was relatively warm, just a little windy! 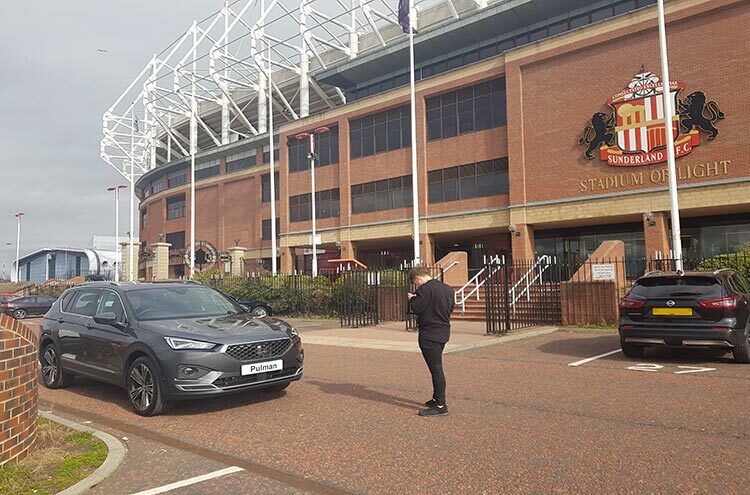 So, we decided to take the SEAT Tarraco to the Stadium of Light on the morning, with our SEAT showroom based in Sunderland, we thought this would be the perfect location. Obviously, we spoke to the security at the stadium to see which areas we could use and they advised us where we could go. We started with the exterior shots and then moved onto the drive road review, then we moved to the interior shots. During the video The Social Co. refers back to the script so they know which key shots to take as well as adding any additional shots which will look good in the final video. Want to find out more about the SEAT Tarraco? Read our latest blog here. 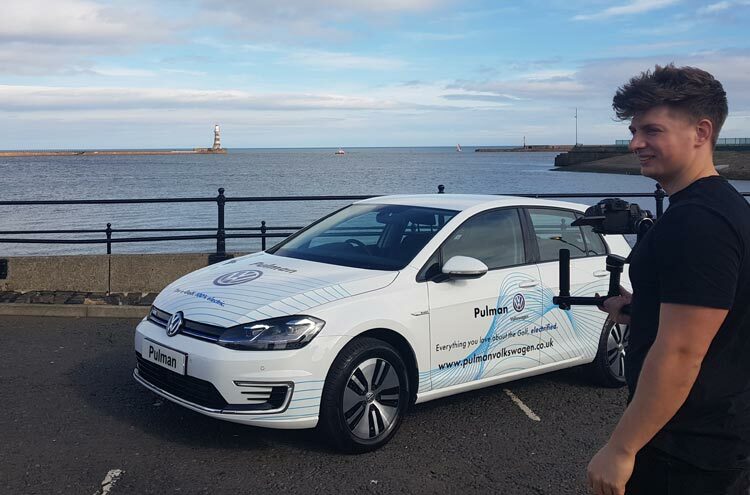 For the Volkswagen e-Golf after driving down by the river at North Hylton, we decided to make a last-minute decision to head to Roker Beach with the weather being positively mild and we have to admit it is a stunning location! The e-Golf was very quick for acceleration as you have 100% power instantly, so we arrived at the location quickly! The same process applied during the afternoon shoot apart from the exterior and interior video was completed before moving onto the drive road review. 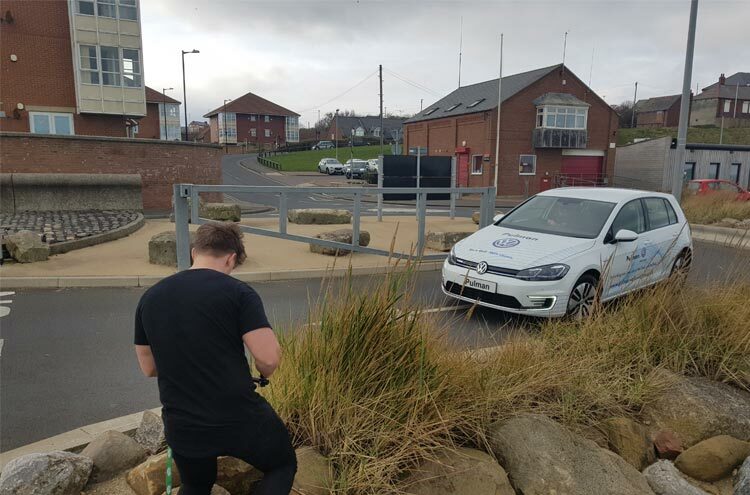 It was a little windy down Roker Beach but a great location, we also met a lovely couple walking their two Border Collie Sheepdogs who we spoke to about electric cars! Find out more on the Volkswagen e-Golf over on our blog post. Overall a very positive day for both reviews! Our car reviews wouldn’t be a success without the help of our voiceover, Graham Courtney and the hard work from The Social Co. in Durham. If you would like to be kept up-to-date with our latest car reviews, follow our social channels which are listed below! View the SEAT Tarraco Offers here. View the Volkswagen e-Golf Offers here.